For the past month, we’ve seen the eclectic works of Yayoi Kusama plastered all over Instagram (#SgLovesKusama). 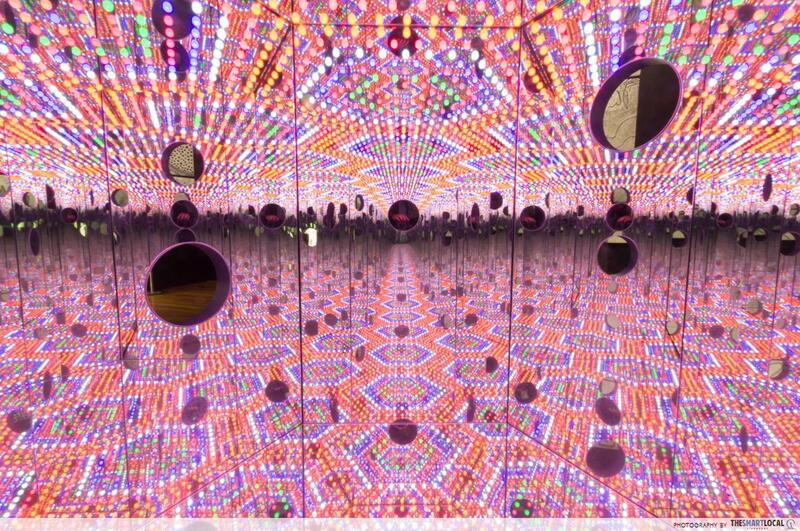 With immersive motifs of dots, nets, and dreamy infinity mirror rooms, the exhibition is the latest “IT” location for curating your social media feed. Kusama's designs are inspired by her hallucinations, resulting in trippy and psychedelic patterns that few conventional artists would dare to emulate. 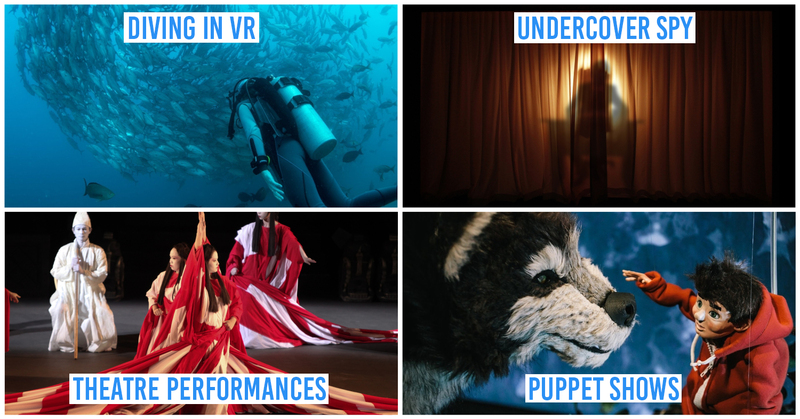 We were determined to present new ways of immersing yourself in Kusama's artistry, and so thought up simple ideas that anyone with the right apps and imagination can implement. 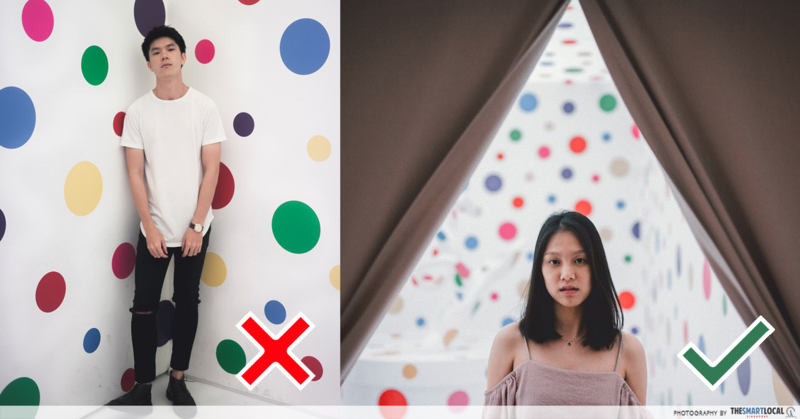 Here are 10 unique shots you can achieve with Kusama’s art that will transform basic into instaworthy with little effort. I WANT TO LOVE ON THE FESTIVAL NIGHT is an iteration of how Kusama's concept of self-obliteration shows up even in reality. Here, it takes the form of what seemed to us like a Japanese night festival mirrored into infinity. 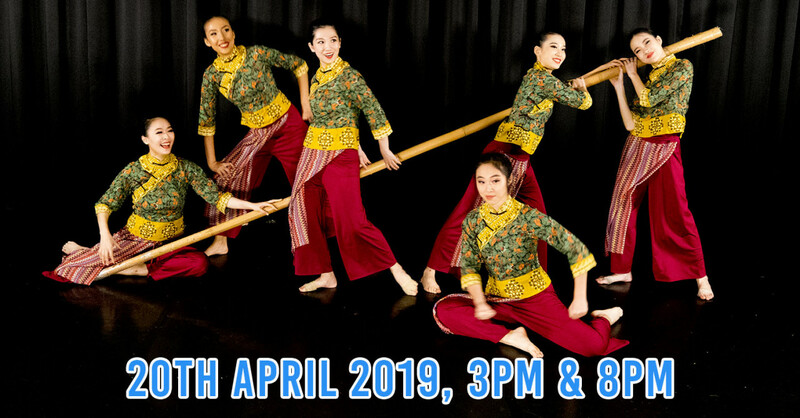 No one light bulb can stand alone to achieve the effect that mirrored box accomplishes, showing how we are all but one part of the world, and only when we come together that meaning is found. 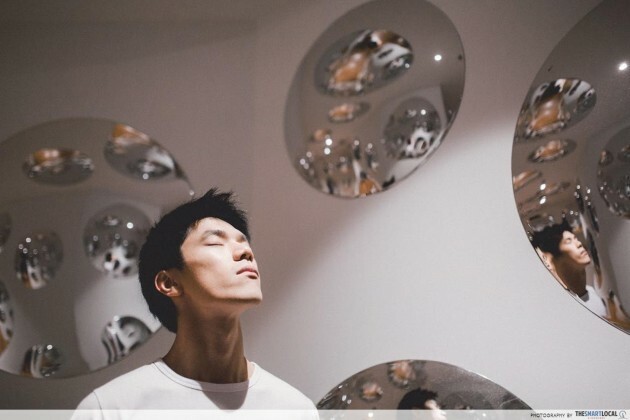 This is an installation created specially for this exhibition at National Gallery Singapore, and you can expect multitudes of LED lights flickering at intervals. 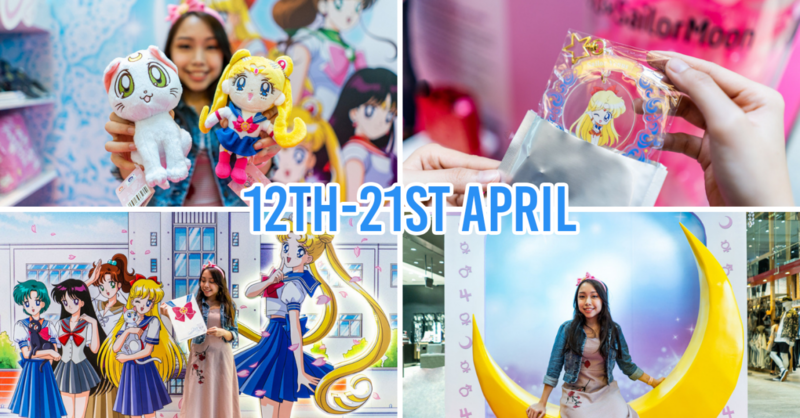 As the exhibit functions as a peepbox, everyone gets all excited with what's inside the three peepholes, skipping the entire journey of looking in. 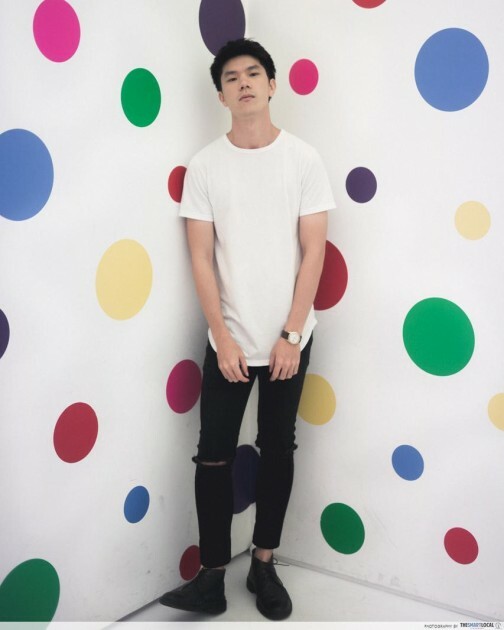 By decreasing the exposure and focusing on the model’s profile with the inside of the peephole as the backdrop, we created a portal-like photo with the help of post-editing tools such as VSCO! Spanning 100 metres, Death of a Nerve is a soft sculpture made from stuffed fabric and is seen in different variations as the exhibition moves from one museum to another. 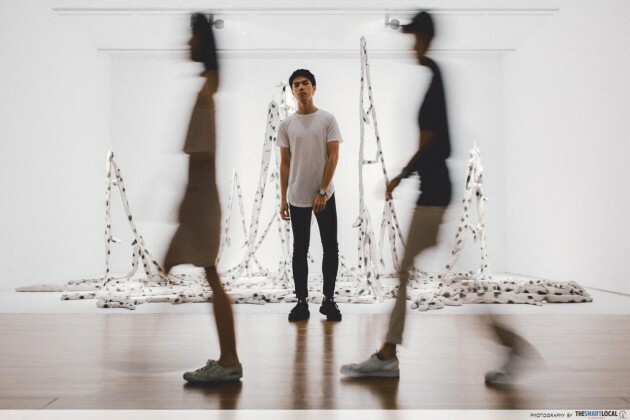 At National Gallery Singapore, it creates an imposing backdrop for this photo. With a still installation and model, you can recreate this photo by setting your shutter speed low (we used ⅕ shutter speed) then cue for your squad to walk past you. The trick is to have unshaking hands as you do this as any camera movement will cause a blurred final image. THE SPIRITS OF THE PUMPKINS DESCENDED INTO THE HEAVENS can seem like two exhibits in one. 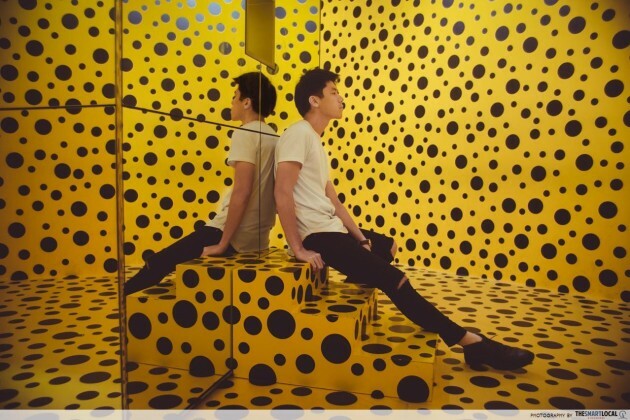 The first is the entirety of the yellow room with black polka dots, and the second the mirror box in it. Entering the room creates an anticipation as you walk around the box, before finally looking into the peephole to where the pumpkins reside. Basic shots taken here will almost always consist of photos of the pumpkins inside the box or an #ootd shot in the room. We chose to create something a little different - a cinemagraph. All you have to do is download a cinemagraph-making app and get creative. Getting your reflection to move while you stand unmoving is a surefire way to get friends rewatching your instavid! 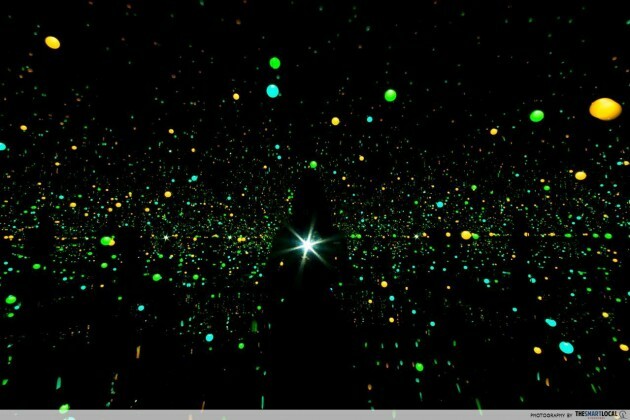 This is where Kusama invites her audience to participate with her art. 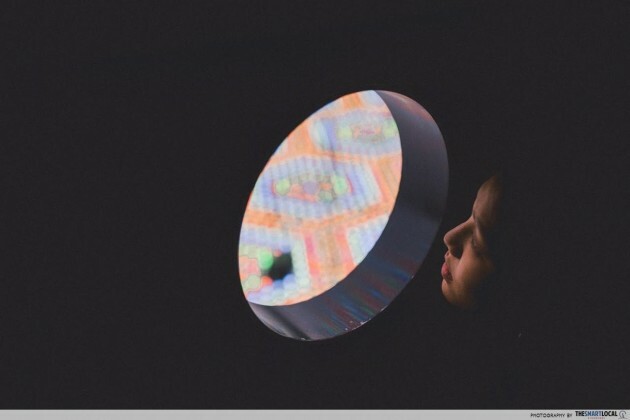 Consisting reflective acrylic convex discs, Invisible Life is a labyrinth where you’d have to meander your way through acute corners while confronting reflections of yourself and of others. With the idea of self in mind, we took this shot. Taking advantage of a lower angle, it was easy for the light to bounce off my face, lighting up the rest of my reflections. As one of the more physically immersive exhibits, it is no wonder that everyone comes to this Infinity Mirrored Room for this photo. Being in an expanded space that repeats itself, the 20 seconds you spend here might make this the most contemplative space in Singapore. The sunstar in the photo is not a result of Photoshop. As we darkened the entire image to induce a sense of an unending environment, we whipped out the torchlight function on our iPhone and angled it straight at the camera. The result is a central focal point for the photo and an appreciation of the scale of the world relative to our model. Check out the infinite reflections on the left! Quite literally, Song of a Manhattan Suicide Addict places Kusama right at the centre of the entire exhibition. 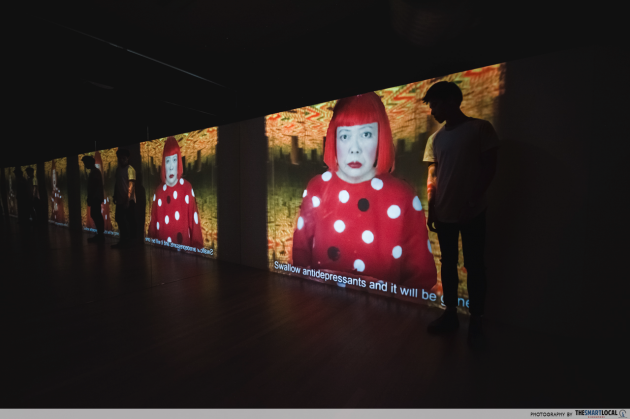 It’s a video installation which provides an insight into Kusama’s worldview as she addresses the viewer directly, singing a poem which gives insight into her mental sufferings and obsessions. 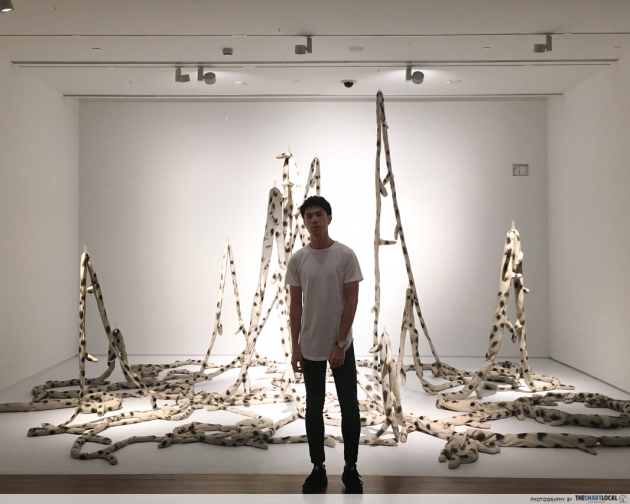 Although this is often seen as a transitional space where few people pause, we took the opportunity to get up close with Kusama when no one was in the room. From a closer angle, we were able to capture my reflections bouncing off infinite mirrors from either side! Definitely worthy to be on your IG feed. With perfect lighting that casts no shadows, With All My Love For The Tulips, I Pray Forever is the perfect exhibit to take an #OOTD in this immersive exhibit. 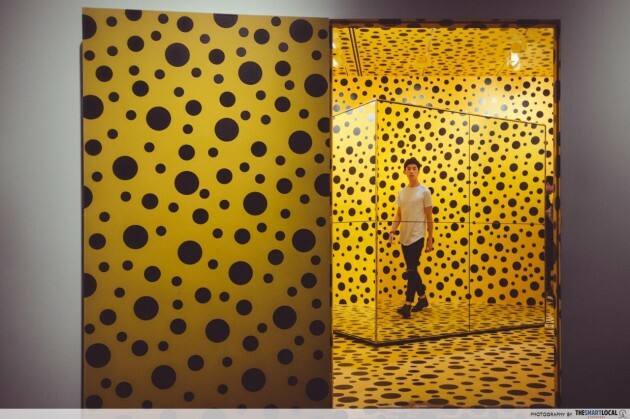 This exhibit is synonymous with Kusama’s concept of “self-obliteration”, where everything from the walls to the "potted plants" was covered in multicolored polka dots, transforming them into a singular entity. 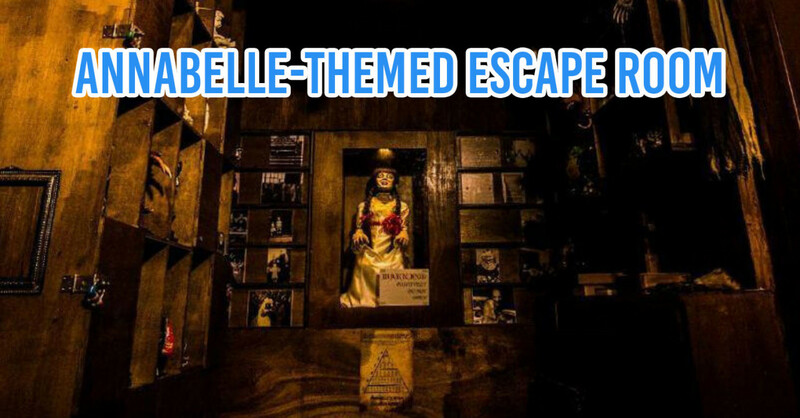 At the end of the exhibit, we were able to capture this moment with Eunice framed in the middle of the triangular exit. 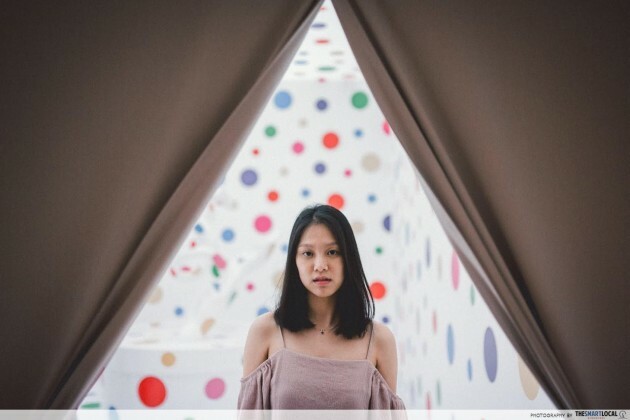 With the camera's focus on her, the "tulip pot" in the background is "bokeh-ed" into the background, showing the extent of Kusama’s obliteration. The Love Forever series consists of 50 pieces of black-and-white drawings lined on the walls of the third gallery. These panels were originally all hand drawn by Kusama, alternating between the abstract and the figurative with her signature motifs of the eye, a human profile, and polka dots. The basic way of framing a picture here involves choosing whether to take photos of every single painting or just one painting with the model standing in the middle of it. We compromised. To showcase more of the art than of ourselves, we made use of the leading lines on the sides of the adjacent paintings and stood right in the middle, making for an imposing portrait. 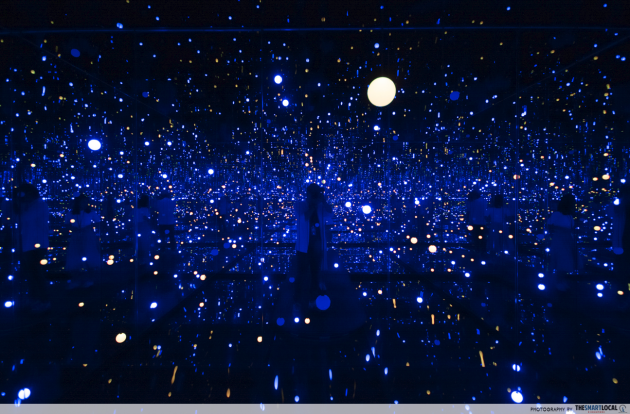 The titular piece of the exhibition can be found in Kusama’s series “My Eternal Soul”, which she started in 2009 with the intention of completing 100 canvases. The series now comprises over 500. Here, we see how she adds on to her familiar motifs while at the same time makes use of new forms and colours in her newer works. 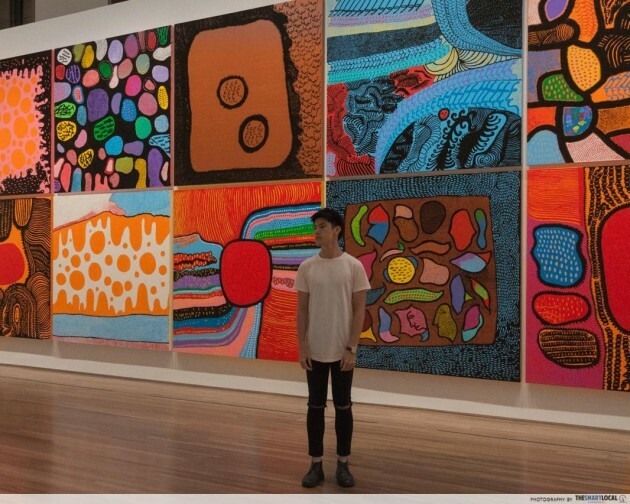 Fun fact: Kusama only decides on the orientation of these paintings after she completes them. To match the energy that this piece brings to this part of the gallery, we took a leaf out of contemporary photographer Natsumi Hayashi’s book and practiced levitation. Prepare to click those shutters at high speed and at an angle! Just be careful not to leap beyond the boundaries marked on the floor. 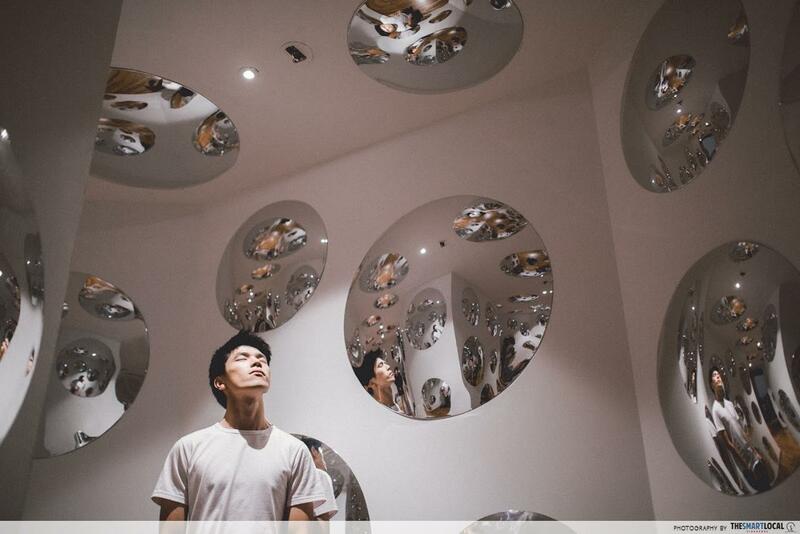 The story behind Narcissus Garden perfectly illustrates Kusama's dauntless spirit. 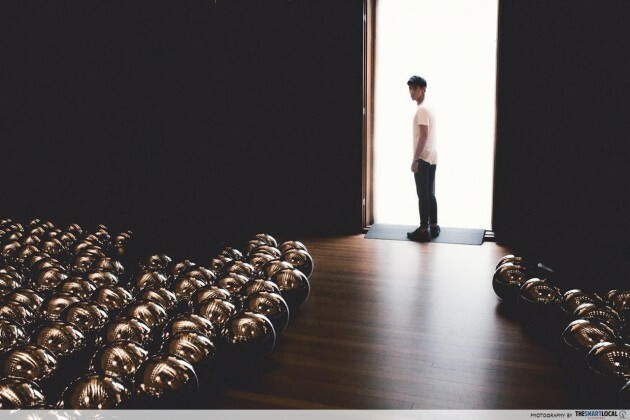 She crashed the 33rd Venice Biennale with 1,500 stainless steel balls to make a statement: that art isn’t only meant for the elite. All over the world, these balls have been displayed in locations with different permutations, whether lying on parquet floors or floating atop lakes. Reaching this room would mean you're at the end of the exhibition, and it is only poetic that we took a shot here, with the reflective balls lining our exit. 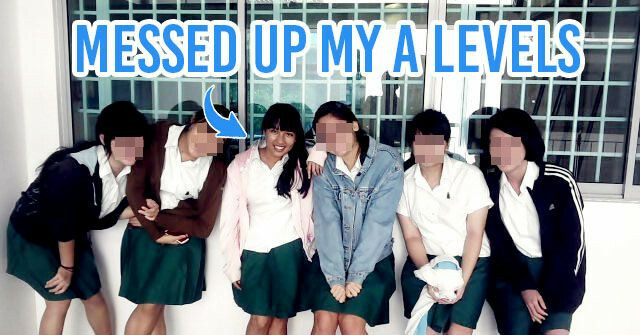 Turn your exposure up and focus on the light by the doorway for your initial photo. As you edit the photo, pump up the “shadows” and the “highlights” of the walls all the way to the darkest end! 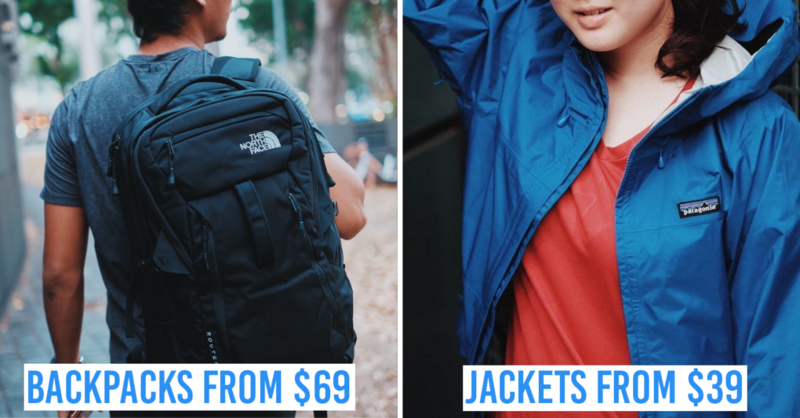 And there you have it, 10 photo options that’ll set you apart from the mainstream Instagrammers. 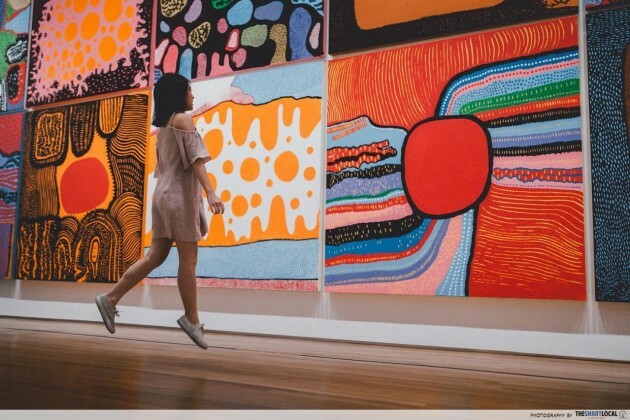 Other than clicking your shutters and editing photos on the go, you’ll be able to see over 120 works that Kusama’s been producing since the 50s throughout the exhibition. 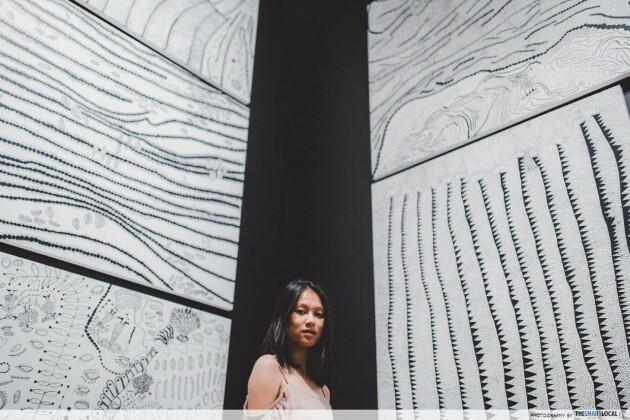 By pausing at individual works, you’ll be able to trace the evolution of Kusama’s life work as an artist and take a glimpse into how the world works through her unique eyes. 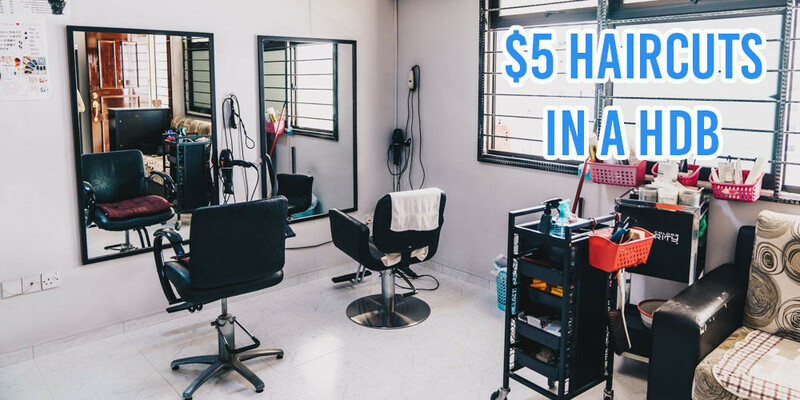 Free for children 6 years and under, local and locally-based students and teachers, persons with disabilities and one caregiver. You can get your tickets to YAYOI KUSAMA: Life Is The Heart Of A Rainbow here. 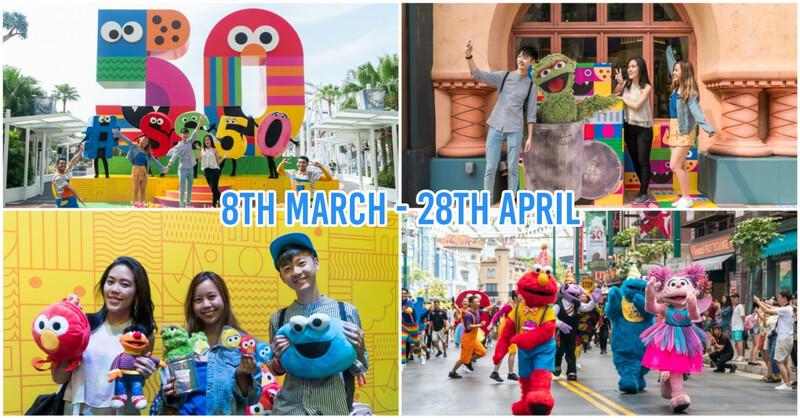 Learn more about #SGlovesKusama here!